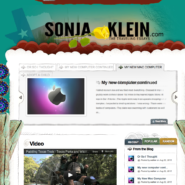 I am in the process of creating a new website entitled www.sonjaroseklein.com It’s not quite finished yet with all the links but I will post it as soon as it is up and running. I think I misspelled IPod and referred to it as my IPad on my blogs about the new computer. Just shows how caught up with modern technology I am. Have been experiencing power surges today. Thunderstorms are forecast. Time to turn off the computer.